Set amid the picturesque shores of Waikiki Beach, the Grand Waikikian by Hilton Grand Vacations Club offers simplistic, yet elegant accommodations under the Hawaiian sun. Find timeshare resales and rentals at the resort priced up to 70% off today. The Hawaiian vacation of your dreams is waiting for you along Honolulu's spectacular shores. 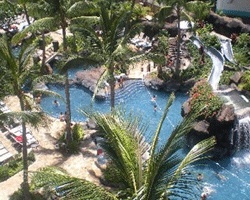 The Grand Waikikian by Hilton Grand Vacations Club is among several resorts in the sprawling Hilton Hawaiian Village. Along with its sister resorts, the Lagoon Tower and the Kalia Suites, the Grand Waikikian offers an array of amenities to make your stay more comfortable. From the on-site spa, to the fitness center, and to the six swimming pools, you'll have everything you need right outside your door to craft an amazing Hawaii vacation. 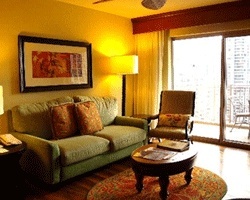 The Grand Waikikian's one- to three-bedroom suites are ideal for both families and couples alike. With enough room for up to eight people, you can find yourself in a luxurious suite high above Waikiki Beach every year. The Grand Waikikian Suites by Hilton Grand Vacations are equipped with modern furnishings and include desirable in-unit amenities like full kitchens, sofa beds, living and dining areas, and so much more. Are you ready to secure your very own accommodations in Hawaii? Explore the affordable timeshare resales and rentals at the Grand Waikikian today. Fill out the form to learn more about ownership options and how you can save, or call a representative at 1-877-815-4227. Buying a timeshare resale at the Grand Waikikian can unlock years of great ownership benefits at a fraction of the price. Since timeshare resales are listed for-sale-by-owner, prices are often much lower than what's offered through the resort itself. It is common to find high-quality resale advertisements priced up to 70% lower than retail costs, allowing you to secure the same great accommodations for thousands less. Timeshare resales at the Grand Waikikian often come in the form of deeded fixed weeks, floating weeks, and even HGVC points, giving you a variety of options to consider. Being able to choose which type of ownership interval works best for you will also let you stay within your budget, ensuring you won't break the bank on accommodations. Timeshares at the resort fall within Hilton's Gold and Platinum seasons. You can also collect HHonors points with your Grand Waikikian timeshare resale. The Grand Waikikian is affiliated with the Hilton Grand Vacations Club, one of the most popular timeshare ownership brands in the world. As a resale buyer at Hilton Grand Waikikian, you won't be able to enroll in the club at the Elite level, but you'll still have a variety of perks and HGVC benefits to take advantage of. You can convert your deeded fixed or floating week to HGVC points in order to make easier reservations, and bank or borrow those points as you see fit. You can also convert them to HHonors points for in-room extras and special discounts at the Grand Waikikian, or exchange for stays at another Hilton resorts. The Grand Waikikian by Hilton Grand Vacations Club is also affiliated with RCI, the world's largest timeshare exchange company. Timeshare exchange provides owners with a way to truly maximize their ownership accommodations, and the same is true for resale buyers. With a separate membership from RCI, you can deposit your week at the Grand Waikikian or your Hilton points to trade for stays at comparable resorts around the globe. What's more, the Grand Waikikian holds a Gold Crown rating from RCI, noting its excellent accommodations and amenities. The Hilton Grand Waikikian incorporates a range of high-quality amenities and services to ensure every guest has the vacation of their dreams. On the resort's grounds and in the wider Hilton Hawaiian Village, you'll find a variety of recreational amenities like six swimming pools and an exercise room for those staying on top of their fitness goals. For beach bums, the world-famous Waikiki Beach is located just beyond the resort's grounds for easy ocean access. The two on-site restaurants, Rainbow Lanai and Tropics Bar & Grill offer spectacular dining options and ice cold cocktails seven days per week. Nearby, all of Honolulu is yours to discover. Head to the Honolulu Zoo or the Waikiki Aquarium to discover unique wildlife, or trek the peak of Diamond Head for incomparable views of the city. Find quaint shops along the Waikiki Beach Walk, or take a picnic to Kapiolani Park. The choice is yours at the Grand Waikikian by Hilton Grand Vacations Club! Already Own at Grand Waikikian by Hilton Grand Vacations Club?